When it comes to planning your wedding, it’s highly possible that you’ll fall into one of two categories: either you’ll know what you want and have a ready-made plan of how you will source it, or you will have so many ideas buzzing around your mind that narrowing down the entertainment ideas for your wedding reception in Leicester becomes a difficult task. With the warmer spring months of the year hopefully making an appearance very soon, comes the most popular time of the year for engaged couples to say their vows. 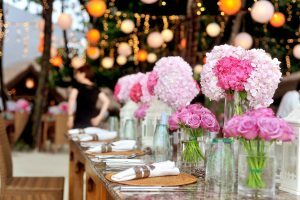 If you are struggling to narrow down your choices, or want something completely unique for your wedding reception entertainment, keep reading. At Solid State UK, we’ve put together a handy list of a variety of entertainment ideas to get your imagination flowing. Believe it or not, traditional games are not just restricted to the dinner table, especially when you super size them! Many traditional games are being made super size, meaning individuals can walk across the board and interact with the game like never before. Whether you’re a fan of traditional board games, have a large indoor or outdoor space to utilise, or simply want to inject some old school fun into your wedding day, adding traditional games to your wedding reception could be a winner. The best time to capture the moment in a photo has to be your wedding day. Everyone is in their finery, everyone is having fun, and a celebration like no other is underway. Photo booths can come with themed accessories, masks, and wigs, as well as a variety of backdrops to capture moments personalised to you. At Solid State UK, we have been offering unique candy carts to our highly valued customers for many years. Perhaps you want to add a touch of vintage to your wedding reception in Leicester with traditional sweets and candy options, or perhaps you want your wedding to follow a certain colour theme; our carts come in a variety of colour schemes and LED lights are also available. At Solid State UK, we are always on hand to help our customers create their perfect day and welcome you to contact a member of our friendly team today.